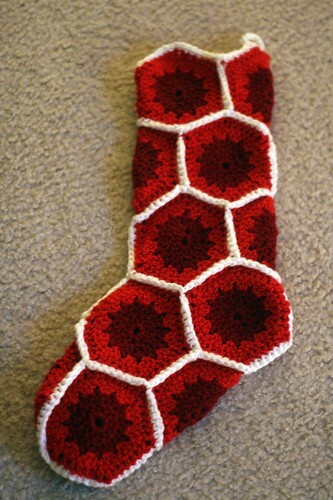 I’ve been in love with Crochet Today’s Stuffable Stockings ever since Erin made her red and white ones a few years ago. 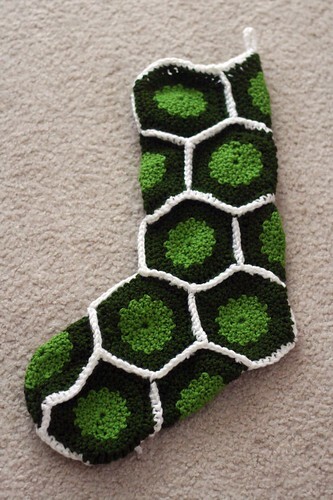 I never felt a strong desire to make a stocking for myself when I lived alone, though, because the ones my grandmother made for me and my siblings way back when are pretty much the most perfect ones ever. 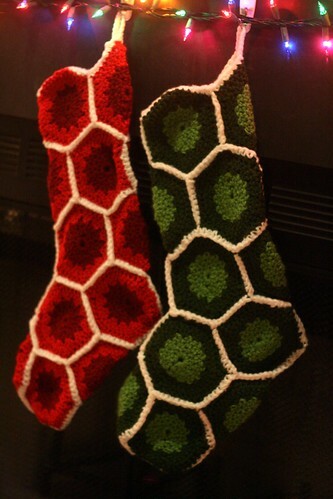 But once I moved in with Dan this summer, having our own stockings seemed a lot more important. I originally planned to knit striped ones, since the idea is to knit the fair isle ones for future children, and I like when the mom and dad stockings don’t match perfectly with the kids’ ones. (I overthink things a bit. Just a tiny bit.) ANYWAY. I couldn’t pick one, and wasn’t sure about my knitting abilities.. and really, I just wanted to crochet. Hexagons and the contrast with the white borders just seemed so perfect. 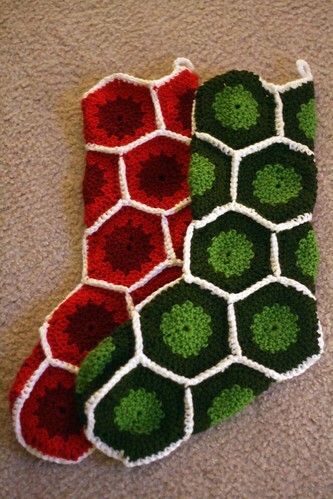 Making the hexagons was really easy, and I ended up going with a forest green and lime for Dan’s stocking (he asked that the forest green be the dominant color) and maroon and bright red for mine, just so they’d go with each other. Stitching them all together, six sides times seventeen hexagons, was not really all that fun. For the red one, which I made second, I was completely flummoxed by the diagram (even though I had already done it successfully with the green one). I finally figured it out, of course, and hung them on the mantle-less fireplace on Monday night. I think they turned out pretty fantastically. I ADORE these! 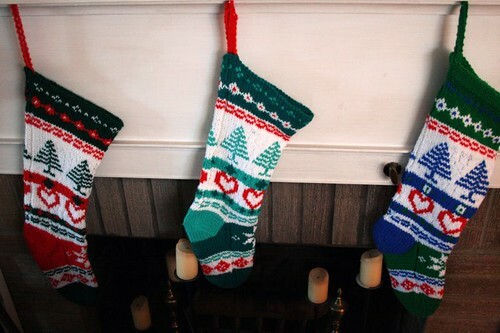 Our family, too, has Grandmom-made knitted stockings. And, after we got married this year, I asked my Mom to knit a matching one for hubby. Now, I am thinking I should keep the old ones together at my parents’ house and do something new for our little family. 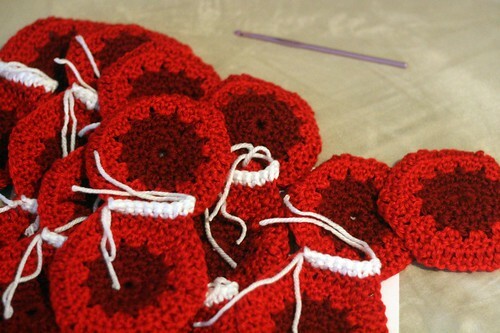 These make me want to learn how to crochet! I know this is way past your blog post date, but I am hoping you remember – and don’t mind sharing – how you joined the hexagons together with the contrasting colour. 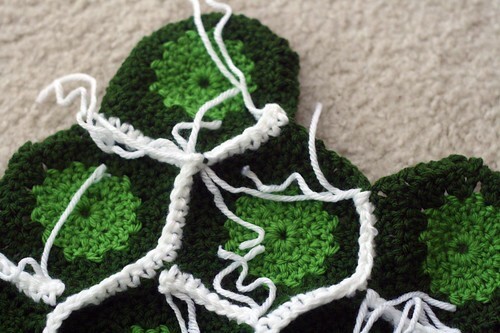 I have just made 100 hexagons for a throw and I desperately want to join them together in this way but I just can’t work out how to do it (I’ve only been crocheting for a few months.) I would really appreciate your help.